A family holiday in Seychelles offers many unique qualities and provides great experiences that will last long in your children's memories. As well as many white sand beaches for safe and enjoyable fun, there's wonderful shell collecting opportunities and superb snorkelling. One of the premier deluxe hotels on Mahé island, offering a choice of sumptuous pool villas - all overlooking the stunning horseshoe-shaped bay of Petit Anse. Great Kid's Club offering a daily activity programme. Superb accommodation - from Villas with pools to lovely Suites. Perhaps the best range of activities within a single resort from tennis courts to zip wires & a climbing wall. There's also two fabulous beaches for great water sports. Excellent choice of accommodation and a great range of activities including a great activity centre. A good choice of water sports is complimented by tennis courts as well as a Kid'd Club. On the west coast beside a sandy beach that is protected by an offshore reef, this hotel offers a relaxed feel. 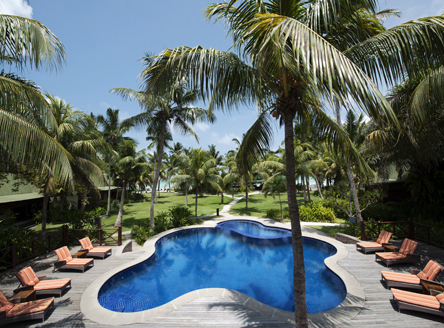 Facilities include a large 25-metre pool and children's pool as well as an AVANI Kid's club. 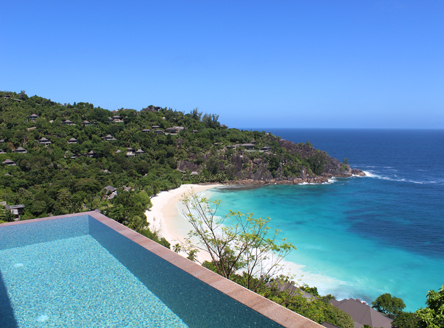 Constance Lemuria Seychelles - 5* resort with 3 beaches! This 5* property, the only hotel with an 18-hole championship golf course in the whole of Seychelles, is set by 3 gorgeous beaches and offers Suite & Villa accommodation. There's a good choice of water sports and a Kid's club. Set in lawned gardens right beside the Cote d'Or beach, this small hotel is renowned for its friendly welcome and great value. Has a good activities centre and always popular with Just Seychelles clients. (No kid's club). 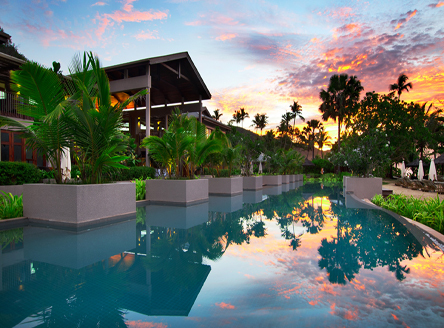 Raffles Praslin Seychelles - 5*Deluxe resort with villas and private pools! Luxury resort featuring spacious Villas, some with two bedrooms, as well as superb facilities including a Kid's and Teen's Club. The hotel has a large swimming pool as well as several small beaches. 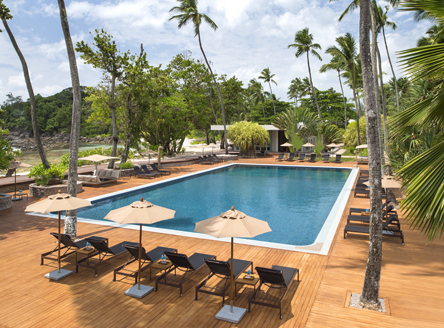 Lovely resort just 10-minutes by boat from the main island of Mahé. A choice of villa accommodation includes pool villas and there's excellent land and water sport activities as well as a Children's Club. Set on stunning Silhouette and just a 40-minute boat transfer from Mahé. Accommodation is in Villas - all of which sleep 2 adults & 2 children. There's a choice of 6 restaurants with the children usually enjoying the pizzeria! Another positive aspect about Seychelles is that it has few dangerous animals, but plenty of rare fauna and flora for kids to be amazed at! From the smallest frog, colourful birds and Giant Tortoises, to the unique Coco de Mer nut - the world's largest seed - your young ones are sure to be amazed. All provide fabulous photo opportunities for them to take back to school! There will even be opportunities for Giant Tortoise feeding as some places. Despite its unique nature, Seychelles is one of the few destinations in the tropics that may be visited without a need for vaccinations; there is little risk of malaria, cholera and yellow fever here. Separate to this, another much ignored reason for taking a Seychelles holiday is that there is is only a 3-hour time difference from the UK for much of the year - meaning less disruption to sleep patterns.